Months of hard work, professional and academic development, stretching out of their comfort zone and intense planning led to a successful learning opportunity for 17 new members of the Morris Innovative High School Translation Academy, as they planned and organized a comprehensive job fair for their peers at the community center. MIHS Teacher Paige Watts said her former group of students who have hosted the annual job fair in years past have all graduated and/or moved on to other required classes. When she gave her new group the target date of November 15, most of the students were unsure of what the Translation Academy was and what the job fair would entail. But, by time the day arrived, every student knew their purpose and gave 100 percent to make the event a success. Junior German Escobar said the process helped him learn the importance of being organized. "The first group of students that came in didn't go as planned. It's a hard thing when your peers come and they don't listen to you because they look at you like any other student," he explained. "We knew we had to be more organized. For example, we had to assign roles for each of us, become leaders, and talk to each other clearly to get the job done. Since doing that, the other groups are going much better." Sophomore Nicole Rocio explained the process of finding businesses that wanted to come and how the students practiced reaching out to them in a professional way. She also explained the students' strategy in selecting the businesses they wanted to invite. "For me, MIHS is like a family. We know each other and talk to each other. We know what each other wants to do in our future," she said. "We picked businesses that our friends at MIHS are interested in. 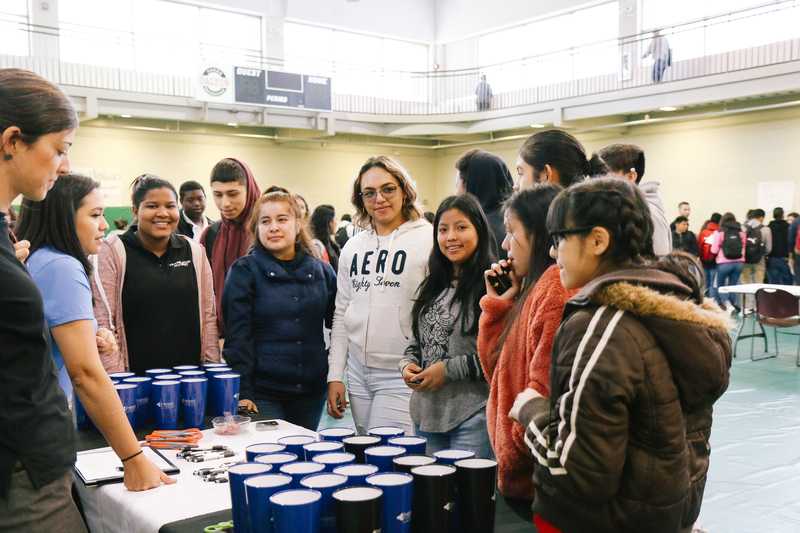 Our goal for the job fair was for the students to meet more people and make connections in the community." Sophomore Andrea Velasquez added the positivity she already noticed in making new community connections. "In our school there are a lot of people who do not know a lot of things about healthcare, so it was important to have healthcare businesses here to teach us about the opportunities we can have," she said. "Some people have asked me questions about where to go for this or that, and I knew what to tell them because I've been researching and talking with these community organizations." Watts said she would sum up the day with the word "generosity" as the community came together to support one another. "I saw the Translation Academy go above and beyond what was required, and I am truly impressed," she said. "Several of the businesses in attendance want to return and spend time with our students in small groups to continue conversations; some want to be mentors." She added that the United Way wants to see the students receive scholarships, the community center employees want the students' help with a specific project, and Dunkin Donuts employees were teary eyed speaking about wanting to be a partner at MIHS. "I could tell more stories, but I think the picture is painted," said Watts. "The spirit of generosity was present, and we are thankful for that!"